Explore and enjoy this perfume collection which was created for your pleasure. You will discover unusual and intriguing fragrances, rare spices worked into unique accords and perfume ingredients you might not yet have heard of. These fragrance descriptions offer but a mere glimpse of each perfume, the fascination you will experience and come to treasure with a passion. Sophisticated, sensual perfumes created with heady substances such as musk, vanilla, exotic woods, spices, tropical flowers and other rich ingredients, such as amber, tobacco, spices, animal notes and tree resins. These wonderfully warm notes may have facets of citrus may be used to freshen them. A rich, Oriental Fragrance with a top of Anjou Pear, Dark Cassis and Orange Slice. The heart is elegantly floral (Black Orchid, Powdery Violet). Last, a devinely sensuous base of Musk, Copahu Balm and Vanilla Pod. This richly aromatic and spicy accord opens with hints of Pomegranate and Cranberry, then flows into a warm heart of Chestnut, Nutmeg, Cinnamon and Clove, to finally rest on a base of Vanilla Pods and drieg Figs, Dates and Persimmons. This is a very large and a most widely used olfactive family and a single flower or a floral bouquet is the main theme of each creation. It is generally split into red flowers (rose, violet,…) and white flowers (jasmin, orange blossom, tuberose, YlangYlang, honeysuckle, …). These florals may be enriched with green, aldehydic, fruity or spicy nuances. A top note of precious Iris leads into a sensuous, intensely feminine floral bouquet of Regal Rose in harmony with Jasmine, Lily of the Valley and Freesia, supported by a deep and warm fond of Crystal Amber, Musk and Rich Woods. A floral fusion of Pink Powdery Rose Petals with Green Violet Leaf and Elegant Iris ! The fragrance opens with top notes of Mandarin, Baies Rose and Pink Peppercorn, and finishes on a sumptuous base of Smooth Patchouli, Musk and Vanilla. Orris, jasmine and Heliotrope enhance the heart note. The aroma of a peaceful, sunlight flooded Orangery with Heady Orange Blossom, Jasmine, Tuberose, Ylang Ylang. The top has subtle fruity aspects of Peach, Apricot and Pear. Warmth radiates from Sandalwood, Musk and Honey. A delicate and yet sprakling white floral note infused with Jasmine Blossom, interlaced with Lily, Tuberose and Ylang-Ylang. The top note has high lights of Apple and Cassis, while the fond rests on a base of creamy Sandalwood and Musk. A beautiful Spring Flowers accord with a fresh top note of Ozone, White Flower Petals and a hint of Watery Melon. The complex heart is floral with Magnolia, Lily, Geranium, Rose and Violet, while the base shines with Musks and Rosewood. A rich white floral top note of Louisiana Magnolia and Jasmine invites you into a soft, enveloping heart of White Musk that is infused with delicious Vanilla pods and a creamy base of Sandalwood. A delectable experience for a gourmet. Frequently referred to as Fougère, or translated as "fern-like". In modern perfumery, this is one of the main olfactive families. The name is derives from the perfume ‘Fougère Royale’ (Houbigant). A beautifully, Aquatic note with Bergamot, Mandarin, Rosemary and fresh Violet Leaves. Radiating from the heart are Sea Salt, White Flowers and Green Tea. The fond vibrates with Woods (Cedar, Patchouli), Amber and Oakmoss. This Innocent White Fragrance opens with aromatic Artemisia and Bergamot, to combine with a heart of Soft White Lavender, Pure Lily, Iris, Hyacinth and Bluebell. The base note sensually envelops with Intense Musk, Sandalwood, Vanilla, Amber and Tonka Bean. Here you find accords created around aromatic herbs (sage, rosemary, thyme, lavender,…) that are normally complemented with citrus and spicy notes. Theirmasculine character makes them a mainstay of men's fragrances. The fresh breeze of aromatic Lavender, Bergamot, Mandarin and Noroli Oil create the sensation of crisp & clean Linen. Airy and Watery Ozonic notes radiate from a transparent floral heart of Rosemary, Basil, Chamomile and Lily of the Valley. The fond is infused with soft, enveloping Musks, Amber and Cedar. A vibrantly fresh fragrance with top notes of Tangerine, Bergamot and Minty Dew Drops. In its heart, it combines a Fruity Pink Lavender note with Lily of the Valley, Freesia and Rose. The base is rich with Musk, Amber and Dried Lavender. This olfactive family concentrates on perfume accords where the heart is one of the following woody scents: sandalwood, patchouli, vertiver or cedar.Hints of citrus or aromatics are typically added to round them of.These are warm and elegant fragrances and more masculine in nature. Sandalwood and patchouli tend to be warm and more opulent in character, whereas cedar and vetiver feel dryer in style. This Noble Perfume of Black Cedarwood is enhanced with the elegance of 'Amber Wood'. Its heart contains Vetiver, Cypress and Juniper Berry. The fond is rich with Aromatic Leather and Frankincense. The aroma worthy of a Connoisseur: Sherry Aged Oak, rich Bourbon Vanilla, Golden Cognac, Caribbean Patchouli, Amber Benzoin and Ancient Labdanum. Known in the perfumery world as ‘hesperidics’, these fragrances with a fresh and light character are built around notes of citrus such as lemon, lime, orange, bergamot, petit grain, grapefruit, neroli and tangerine. These accords typically have elements of other orange-trees (orange blossom, petit grain, neroli), flowers (white flowers) or hints of chypre but also aromatic, woody and spicy materials to give depth and richness. The family includes all types of ‘Eaux Fraîches’ and was typified by the first ‘Eaux de Colognes’. A vibrant Pink Grapefruit fragrance with the added complexity of Mandarine, Lime and Bergamot. Floral notes of Jasmin and Lily lend a feminine touch. Deep sophistication comes from a Sandalwood Accord in the base note. The refreshingly sophisticated bouquet of White Tea, Ripe Bergamot and Lime Leaves, infused with Aromatic Thyme, Jasmine Tea, White Lily, Nutmeg and Black Pepper, it rests on a base of Woody, Powdery Musk. The intensely spicy but zesty fragrance of Fresh Ginger with a garland of Lemongrass, Bergamot, Lime and Orange. The heart note displays Clove, Cardamom, Jasmine, Lily and Coriander, while the fond consists of Musk and precious Woods. The Essence of a Mediterranean Vacation: a sophisticated accord built around the vibrant notes of Neroli, Pomelo, Lime and Petitgrain. Jasmine Petals, Vertiver, Patchouli and Aged Leather add depth and warmth to complete the sensation of walking through an olive grove on a warm, sunny day. A fozzilised tree resin, Amber is valued for its colour and beauty fossilized tree resin which has been appreciated for its color and natural beauty through the ages. In perfumery, ‘amber’ accords reflect the golden colour and its rich warmth. The scents tend to be musky, honey-like, oriental and earthy in combination with elements of vanilla, spices (e.g. clove), labdanum, benzoin resin or incense. This beautifully soft ‘Noir’ fragrance opens with top notes of Anise and Liquorice to add mystique to a heart built around the Vanilla and Almond nuances of Heliotrope and Powdery Violet. Sandalwood and Amber add warmth to the fond. The aroma of freshly baked Cup Cakes coming out of the oven: sweet baked Toffee Apples enveloped in a fluffly, warm pastry with Vanilla, Amber and Precious Woods. The notes in this group are typically based around an accord of oak moss, ciste-labdanum, patchouli and bergamot. Other woody, mossy and floral notes may be added and even replace some of the element. The richness of these fragrances mixes beautifully with citrussy, lavender, leathery or fruity notes. Chypre accords are rich and long-lasting in character. An early and classic example of this family is ‘Chypre’ by Coty (1917). A Creamy Sandalwood accord with a hint of Chypre ! It includes top notes of Neroli and Lychee, a floral heart of White Jasmine, Violet and Cistus Labdanum, and a fond of sun-bleached Cedar, Patchouli, Musk and Tonka Bean. This olfactive group has no limits: beautiful, fruity fragrances with berries (strawberries, raspberries, loganberries, blueberries, ...), sweet juicy fruit (peaches, nectarines, mango, papaya, ...), tropical fruit (coconut, pineapple,... ), Kiwi, melons, ... there are always new enticing fruit varieties to try. Unlike the afore mentioned catogories, Skin Care and Toiletries products typically take the lead here. Shower gels, soaps or lotions are more likely to introduce a new type of fruit than an Eau de Toilette. The unmistakable aroma of Ripe Red Berries, freshly picked during a summer’s walk: Strawberries, Blackberries and Loganberries. This opening accord is followed by a heart of Bulgarian Rose, Star Anise, Raspberry Macaroon and a finale of Tonka Bean and Vanilla Ice Cream. 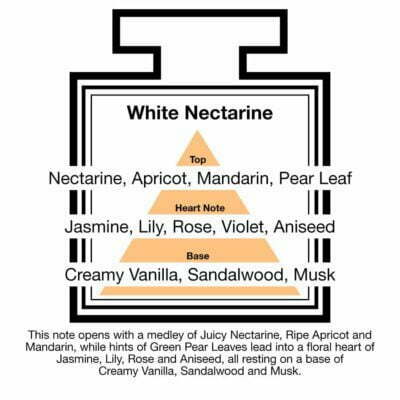 This note opens with a medley of Juicy Nectarine, Ripe Apricot and Mandarin, while hints of Green Pear Leaves lead into a floral heart of Jasmine, Lily, Rose and Aniseed, all resting on a base of Creamy Vanilla, Sandalwood and Musk. Pure luxury with a conscience.